We offer Adirondack Chairs from Kingsley Bate(Teak), Berlin Gardens and Malibu(Poly Lumber), and Telescope Casual(Marine Grade Polymer). All are built to last and virtually maintenance free from the most respected manufactures in the patio business. Many different colors are available in multiple styles. Choose from traditional adirondack chairs to more modern designs, all with varying sizes. These adirondack chairs all carry a fantastic manufactures warranty that will allow you to be able to enjoy them for a very long time. 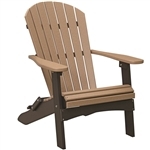 Adirondack Chairs at Porch and Patio Online offer Fast Free Shipping all at a Great Price!